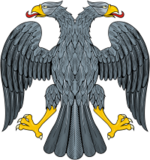 The double-headed eagle, which remained the de jure coat of arms of Russia until 10 July 1918. Never formally used prior to the dissolution of the Assembly. A democratically elected Constituent Assembly to create a Russian constitution was one of the main demands of all Russian revolutionary parties prior to the Russian Revolution of 1905. In 1906, the Tsar decided to grant basic civil liberties and hold elections for a newly created legislative body, the State Duma. However, the Duma was never authorized to write a new constitution, much less abolish the monarchy. Moreover, the Duma's powers were falling into the hands of the Constitutional Democrats and not the Marxist Socialists. The government dissolved the Duma, as was their legal agreement, in July 1906 and, after a new election, in June 1907. The final election law written by the government after the second dissolution on 16 June [O.S. 3 June] 1907 favored the landed and ruling classes. What little the Duma could do after 1907 was often vetoed by the Tsar or the appointed upper house of the Russian parliament. The Duma was therefore widely seen as unrepresentative of the lower working classes, and the demands for a Constituent Assembly that would be elected on the basis of universal suffrage continued unabated. Over the next few weeks, the Bolsheviks established control in urban areas and in almost all of Great Russia, but had less success in the countryside and in ethnically non-Russian areas. Although the new Soviet government limited the freedom of the press (by sporadically banning non-socialist press) and persecuted the liberal Constitutional Democratic party for its undeclared but widespread support of General Kornilov's aborted coup, it allowed elections for the Constituent Assembly to go ahead on 25 November [O.S. 12 November] 1917, as scheduled by the Provisional Government. Hence the Soviets of Peasants' Deputies, primarily the uyezd and then the gubernia Soviets, are from now on, pending the convocation of the Constituent Assembly, vested with full governmental authority in their localities. The bottom line was that the Bolsheviks received between 22% and 25% of the vote, albeit as clear winners in Russia's urban centers and among soldiers on the "Western Front" (two-thirds of those soldiers' votes). In the city of Moscow, for example, the Bolsheviks won 47.9% of the votes, the Constitutional Democrats (Kadets) 35.7% and the SRs 8.1 percent. While losing the urban vote, the Socialist-Revolutionary Party received around 57-58% (62% with their social democratic allies), having won the massive support of the rural peasantry who constituted 80% of the Russian population. With the signing of the Treaty of Brest-Litovsk by the Bolsheviks on 3 March 1918, the Socialist Revolutionary leadership increasingly viewed the Bolshevik government as a German proxy. They were willing to consider an alliance with the liberal Constitutional Democrats, which had been rejected as recently as December 1917 by their Fourth Party Congress. Socialists and liberals held talks on creating a united anti-Bolshevik front in Moscow in late March. However, the negotiations broke down because the SRs insisted on re-convening the Constituent Assembly as elected in November 1917 while the Constitutional Democrats, who had polled weakly in the November election, demanded new elections. After the Bolshevik victory in the Southern Front of the Civil War in late 1920, 38 members of the Constituent Assembly met in Paris in 1921 and formed an executive committee, which consisted of the Constitutional Democrats leader Pavel Milyukov, one of the Progressist leaders Aleksandr Konovalov, a Ufa Directory member Avksentiev and the head of the Provisional Government Kerensky. Like other emigre organizations, it proved ineffective. According to the 1975 book Leninism under Lenin by Marcel Liebman, the Bolsheviks and their allies had a majority in the Soviets due to its different electoral system. Per the 1918 Soviet Constitution, each urban (and usually pro-Bolshevik) Soviet had 1 delegate per 25,000 voters. Each rural (usually pro-SR) Soviet was only allowed 1 delegate per 125,000 voters. The Bolsheviks justified closing down the Assembly by pointing out that the election did not take into account the split in the SR Party. A few weeks later the Left SR and Right SR got roughly equal votes in the Peasant Soviets. The Bolsheviks also argued that the Soviets were more democratic as delegates could be removed by their electors instantly rather than the parliamentary style of the Assembly where the elected members could only be removed after several years at the next election. The book states that all the elections to the Peasant and Urban Soviets were free and these Soviets then elected the All-Russian Congress of Soviets which chose the Soviet Government, the Second Congress taking place before the Assembly, the Third Congress just after. Two more recent books using material from the opened Soviet archives, The Russian Revolution 1899-1919 by Richard Pipes and A People's Tragedy by Orlando Figes, give a different version. Pipes argues that the elections to the Second Congress were not fair, for example one Soviet with 1,500 members sent 5 delegates which was more than Kiev. He states that both the SRs and the Mensheviks declared this election illegal and unrepresentative. The books state that the Bolsheviks, two days after the dissolution of the Constituent Assembly, created a counter-assembly, the Third Congress of Soviets. They gave themselves and the Left Socialist-Revolutionaries 94% of the seats, far more than the results from the only nationwide parliamentary democratic election in Russia during this time. ^ The Bolsheviks: the intellectual and political history of the triumph of communism in Russia : with a new preface. Adam Bruno Ulam. Harvard University Press. p. 397. ^ V. I. Lenin, Theses on the Constituent Assembly (1917), Lenin Internet Archive. ^ Vladimir Ilyich Lenin, The Tasks of the Proletariat in the Present Revolution (a.k.a. The April Theses) (1917), Lenin Internet Archive. ^ For an account of the closure of the non-socialist newspapers in Petrograd by the Military Revolutionary Committee on 26 October see Nikolai Sukhanov, The Russian Revolution, 1917, Oxford: Oxford University Press (1955), pp. 649-650. For the first Sovnarkom decree on press censorship see Rex A. Wade, The Russian Revolution, 1917, Cambridge: Cambridge University Press (2005), p.276. For the second Sovnarkom decree that established more extensive government control of the press see V. I. Lenin. Collected Works, Progress Publishers, Moscow, Volume 26, 1972, pp. 283-284, available online. ^ V. I. Lenin, The Extraordinary All-Russia Congress Of Soviets Of Peasants' Deputies: Speech On The Agrarian Question November 14, Lenin's Collected Works, Moscow: Progress Publishers (1972), Vol. XXVI, pp. 321-332. Available online. ^ See V. I. Lenin. On The Opening Of The Constituent Assembly, Collected Works, Progress Publishers, Moscow, Volume 26, 1972, pp. 367, available online. ^ Christopher Read, Lenin: A Revolutionary Life, Abingdon: Routledge (2005), p. 192. ^ Nikolai N. Smirnov, "Constituent Assembly", in Edward Acton, Vladimir Iu. Cherniaev & William G. Rosenberg (eds. ), Critical Companion to the Russian Revolution 1914-1921, Bloomington: Indiana University Press (1997), ISBN 978-0-253-33333-9 p. 332. ^ Orlando Figes, A People's Tragedy: The Russian Revolution 1891-1924, London: Pimlico (1997), p. 514. ^ Viktor Chernov, edited Dmitri Sergius von Mohrenschildt, selection from pgs. 68-72 from The Russian Revolution of 1917: Contemporary Accounts, in Russia in War and Revolution, 1914-1922, edited by Jonathan Daly and Leonid Trofimov (Indianapolis: Hackett, 2009), 214-5. ^ Fyodor Fyodorovich Raskolnikov, selection from pgs. 1-20 from Tales of Sub-Lieutenant Ilyin, in Russia in War and Revolution, 1914-1922, edited by Jonathan Daly and Leonid Trofimov (Indianapolis: Hackett, 2009), 219-20. ^ Ronald W. Clark, Lenin: The Man Behind the Mask, London: Faber and Faber (1988), p. 304. ^ a b Orlando Figes, A People's Tragedy: The Russian Revolution 1891-1924, London: Pimlico (1997), p. 516. ^ Ronald W. Clark, Lenin: The Man Behind the Mask, London: Faber and Faber (1988), pp. 304-5. ^ Christopher Read, Lenin: A Revolutionary Life, Abingdon: Routledge (2005), p. 193. ^ a b Orlando Figes, A People's Tragedy: The Russian Revolution 1891-1924, London: Pimlico (1997), p. 517. ^ Ronald W. Clark, Lenin: The Man Behind the Mask, London: Faber and Faber (1988), p. 305. ^ Orlando Figes, A People's Tragedy: The Russian Revolution 1891-1924, London: Pimlico (1997), pp. 518-9. ^ E. H. Carr, The Bolshevik Revolution 1917-1923, London: Penguin (1966), p. 121. ^ O. H. Radkey, The Election to the Russian Constituent Assembly of 1917, Cambridge, MA: Harvard University Press (1950), p. 72. ^ O. H. Radkey, The Election to the Russian Constituent Assembly of 1917, Cambridge, MA: Harvard University Press (1950), p. 2. ^ See Scott Smith, op. cit. Archived 2 September 2006 at the Wayback Machine on the Bolshevik non-recognition of anti-Bolshevik deputies in Petrograd, Astrakhan, Tula, etc. ^ See Ronald Grigor Suny. The Soviet Experiment: Russia, the USSR, and the Successor States, Oxford University Press, 1998, ISBN 978-0-19-508105-3 p. 80. ^ See Elizabeth A. Wood. Performing Justice: Agitation Trials in Early Soviet Russia, Cornell University Press, 2005, ISBN 978-0-8014-4257-5, p. 83. ^ See Georg Schild. Between Ideology and Realpolitik: Woodrow Wilson and the Russian Revolution, 1917-1921, Contributions to the Study of World History, ISSN 0885-9159, no. 51, Greenwood Press, Westport, CT, 1995, ISBN 978-0-313-29570-6 p. 111. ^ See Arnol'dov. Zhizn' i revoliutsiia, p. 158, quoted in Jonathan D. Smele, op.cit., p. 254. ^ See Nikolai N. Smirnov, "The Constituent Assembly" in Critical Companion to the Russian Revolution 1914-1921, op. cit., p. 332. Fanny Efimovna Kaplan was a member of the Socialist Revolutionary Party who allegedly tried to assassinate Vladimir Lenin. Víktor Mikháilovich Chernóv was a Russian revolutionary and one of the founders of the Russian Socialist-Revolutionary Party. He was the primary party theoretician or the 'brain' of the party, and was more analyst than political leader. Following the February Revolution of 1917, Chernov was Minister for Agriculture in the Russian Provisional Government. Later on, he was Chairman of the Russian Constituent Assembly. Vladimir Mikhailovich Zenzinov was a member of Russia's Socialist-Revolutionary Party, a participant of the First (1905), Second, and Third Russian Revolutions, and an author of a number of books. Avram Rafailovich Gots was a Russian Socialist-Revolutionary leader, active in the Revolutions of 1905 and 1917. Boris Davidovich Kamkov was a Russian revolutionary, a leader of the Left Socialist-Revolutionaries and a member of the Council of People's Commissars. He was killed during the Great Purge. The Socialist Revolutionary Party, or Party of Socialists-Revolutionaries was a major political party in early 20th century Imperial Russia. There are numerous, conflicting accounts on the outcome of the November-December 1917 election to the All-Russian Constituent Assembly. The Constituent Assembly election, which took place in the midst of the First World War and the October Revolution, was the largest exercise of universal suffrage in the history of mankind until that date. Spanning over decades, different historical research projects have been undertaken to try to map the puzzle of outcomes of the election from the various constituencies. The Steppes electoral district was a constituency created for the Russian Constituent Assembly election, 1917. The electoral district covered the Akmolinsk Oblast and the Semipalatinsk Oblast. According to Wade (2004), it is unclear whether the election was carried through to completion in the electoral district. The Kharkov electoral district was a constituency created for the Russian Constituent Assembly election, 1917. The electoral district covered the Kharkov Governorate.